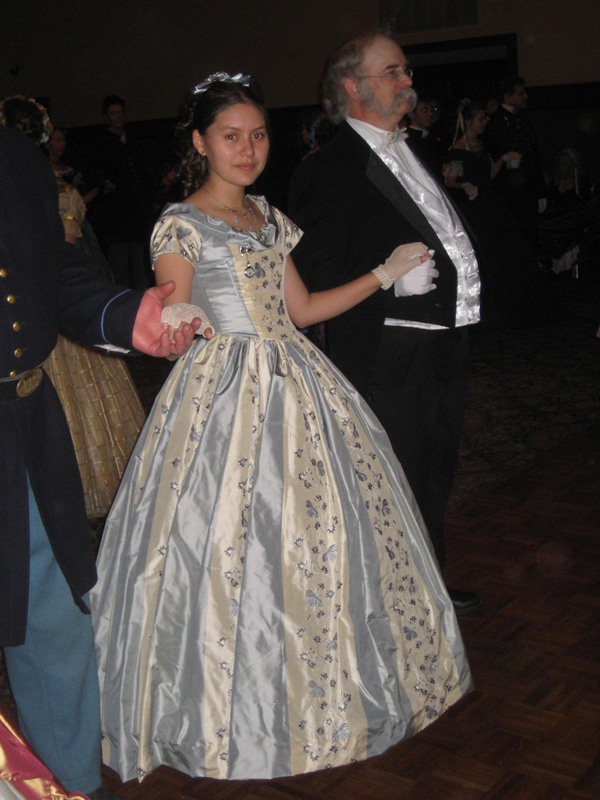 This lovely civil war ball gown brings to life the crinoline era, or early Victorian period. 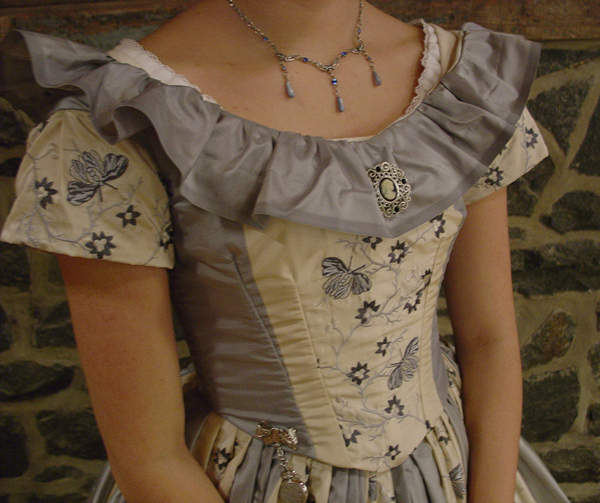 The pale cerulean blue and cream striped fabric is embroidered with flowers and butterflies in the stripes. This is a silk fabric with rayon embroidery from vintage curtains found at auction, yes, this makes it a real Scarlet O’Hara dress since it is made from curtains. We removed the linings and hooks and recycled them into new curtains. 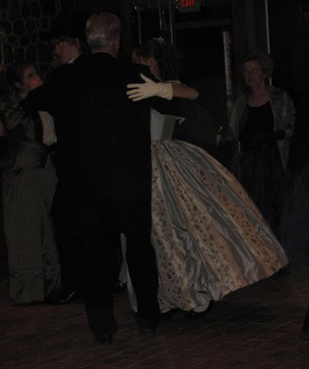 Pale colors were much favored for candlelit ballrooms and by younger ladies. My daughter loves blue, butterflies, and flowers so this fabric was a given for her gown. 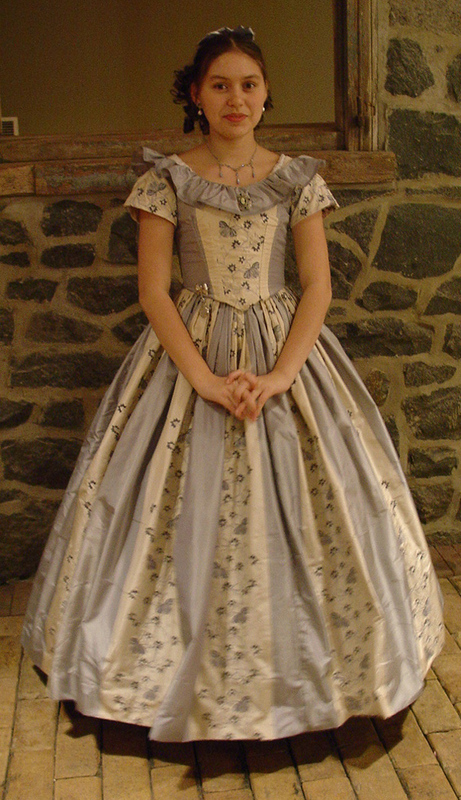 The bodice is pieced to center the embroidery motif on each side and it is finished with a self fabric bertha proportioned to balance the gown on a small stature. The smooth line of the body emphasizes the small waist with wide shoulders and the width of the hoop. The bertha, or gathered and ruched section across the neckline, emphasizes the width at the shoulders and creates a lovely self-fabric trim. 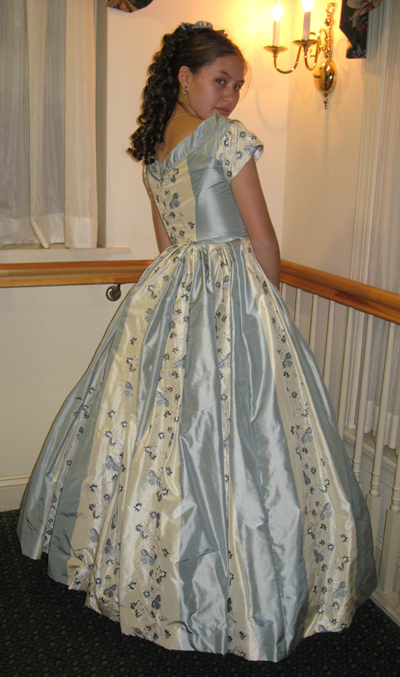 This gown is made from silk taffeta and is hand finished to complete the period look. Starting to balance the skirts, but indecisive on what kind of pleats I want...light weight linen (ie $6 worth of curtain scarves from goodwill) in a grey- green color. This was the bodice I test wore Saturday. Test wear of new bodice under my jacket, it stayed comfy all day and made me keep my shoulders back and down!